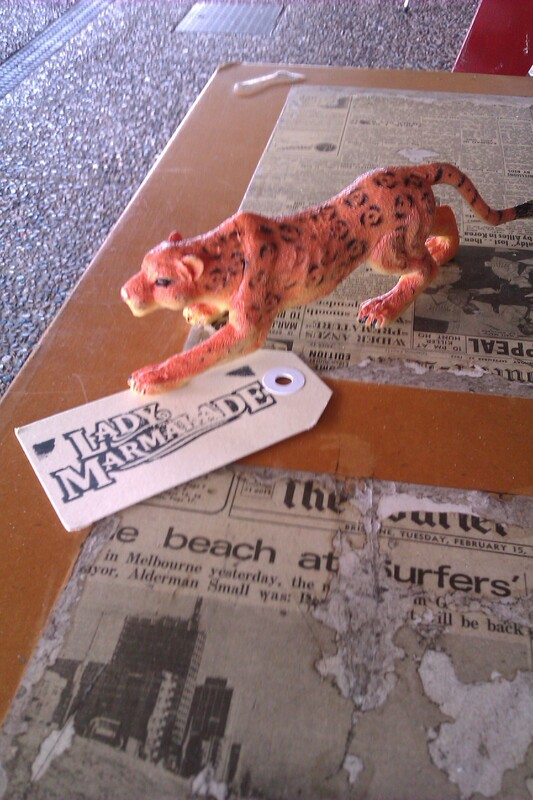 So in order to catch up with a friend before Christmas, I just HAD to go to Lady Marmalade at Stones Corner for lunch AND they just won map magazine’s best lunch 2013 award. Life is tough. The hardest part was deciding what to eat, as there were lots of vego options and even a vegan option with greens, sweet potato, black beans, tofu and dukkah. I ummed and ahhhed and went for the mushrooms with mojo verde (a tangy non-basil pesto?) on brioche with goats’ cheese. I ordered a potato and feta hash on the side. My friend was going to go for the haloumi (because obvious) but ended up having the herbed avo toast with tomato and a SIDE of haloumi. Genius. This is why I have such great friends. Because they piece together brilliant meals. The café was busy but not full and we got quick service and meals. 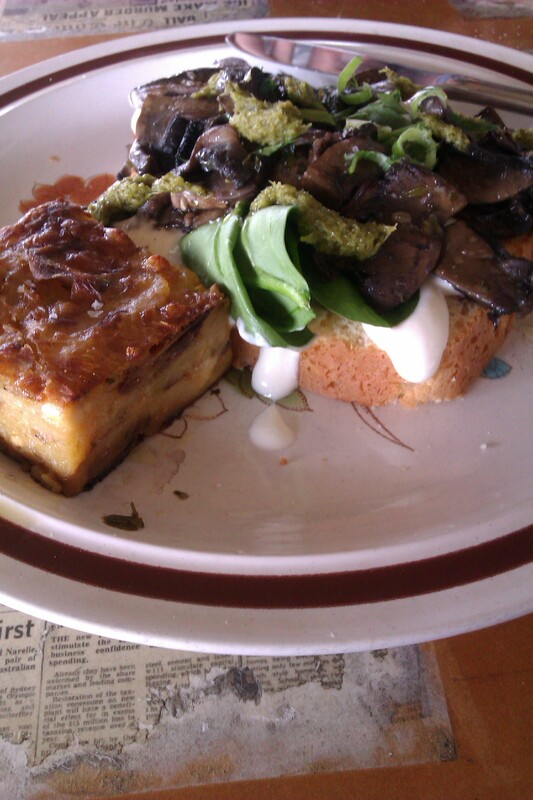 My mushrooms were well cooked and came with spinach but didn’t appear to come with the goats’ cheese. Instead, there was a yoghurt looking but cheesy tasting sauce under my mushrooms. It was still delicious and as long as no one mayo-bombed me (I don’t like mayo [but like aioli]) I didn’t mind. The potato feta hash was really good- I find that sometimes the cheese taste gets lost but you could actually pick it as an ingredient and I didn’t want to add salt to it. My friend was really happy to discover her tomatoes were in a really nice dressing and although she couldn’t pick the herbs in her avo, I think there was mint, coriander and possibly basil. We paid less than $30 total for our brekkies including sides and my soy iced latte. I really liked the attention to the flavours in each item- whether it was a main or a side it worked well and didn’t need heaps of salt and pepper. We even got to see a guy ride past in a plastic canoe/bicycle thing. Value. So for my first day of holidays, I went to lunch with two friends, one of whom I hadn’t seen in ages. I’m really not familiar with Milton because I’ve always been scared off by the terrible parking situation. If I’d known Comfort at My Table had been waiting for me all this time, I would have been there years ago. It looks like quite a small café from the front but opens into a large airy space with big white tables and mismatched chairs. 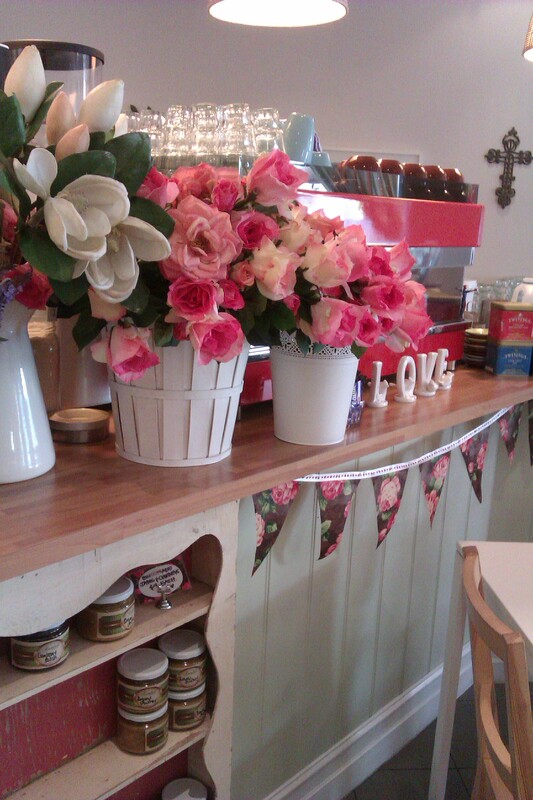 The décor is decidedly girly- pale pink walls, floral bunting and a shabby chic feel, but this didn’t stop heaps of local businessmen from popping in for a meal or a take-away coffee while we were there, a good sign considering there are lots of other coffee places nearby. Comfort specialises in breakfast but also serves lunch and sweet things. One friend ordered a sandwich and the other scrambled eggs with mushrooms. 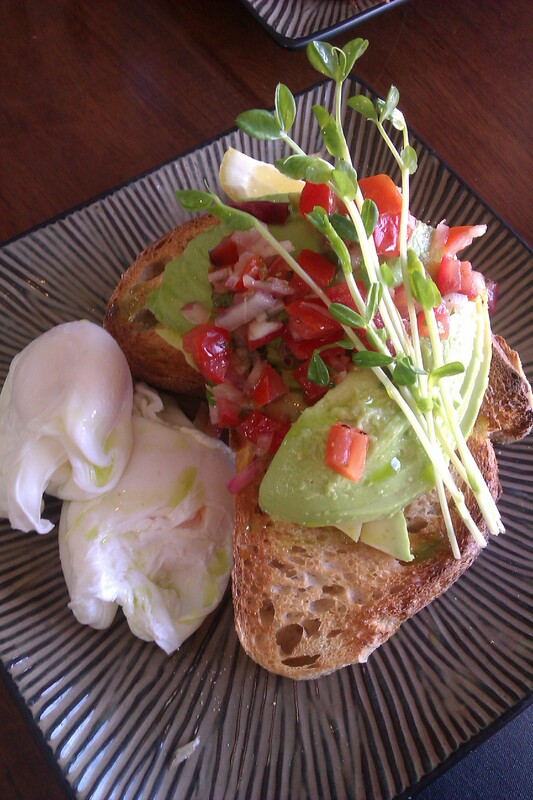 I ordered the avo toast with Danish feta and tomato relish for $10.80 and a poached egg on the side ($1.50). My first thoughts were “That’s not a cheap avo toast”. 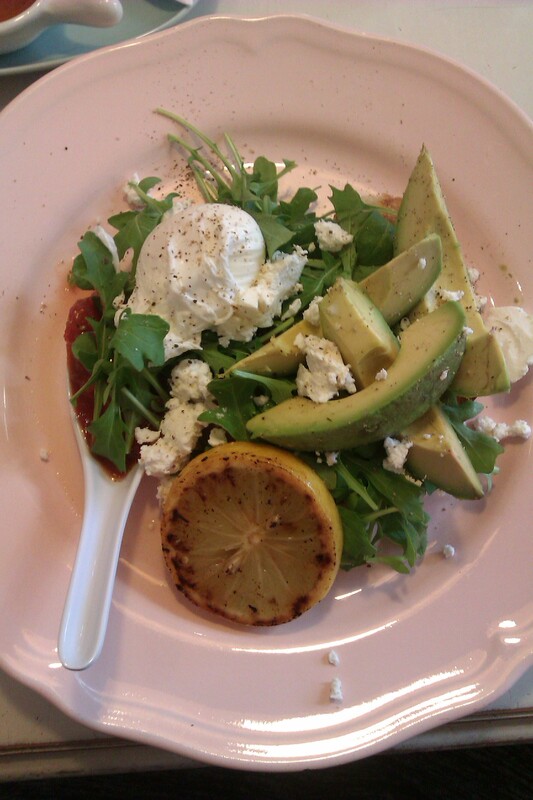 I stood corrected when a huge and delicious pink plate came out with a slice of roasted lemon and plenty of rocket as well as a really tangy creamy danish feta (I always thought feta had to be one or the other). You pay for care and things made at the café itself. It was divine. I also ordered a pot of chai which is supposed to be a specialty. It came out properly brewed in a pot with honey on the side (even though I stayed strong and didn’t have the honey). It was a lovely tea. I thought it might be T2 Chai, but it lacked the liquorish hit T2 has. The waiter didn’t know either- it’s a secret! He also said that he once guessed it might be T2 but confirmed that it wasn’t. Whatever it was, it was lovely as were the waiters who were present, very pleasant and attentive but never intrusive. They also serve Krazy Lemonade, a local product I’ve had at the West End markets many a Saturday. All the baking is done in house. Overall, it was a well done: service, décor, food and pricing was all spot on. There really wasn’t any vegan options already on the menu, but the avo toast could easily be done without feta and there was toast and fruit toast available. If I wanted a hot vegan option, I’d be incline to order toast and then add some sides like thyme mushrooms, chat potatoes (yum), baked beans, avocado and roast tomato (providing everything was not cooked in butter of course). Soy milk and gluten free bread were available. After one of my lovely ladies went back to work, the other and I wandered down Railway Terrace to Park Road. We discussed how the café would be lovely for a Kitchen Tea or Baby Shower- it was definitely feminine, but more Shabby Chic meets Happy Modern, and not over the top. I know Comfort has been around for a while, but I really was delighted at how “correct” everything was and how much I enjoyed my breakfast for lunch. So I wanted to have coffee with an old colleague a little while ago. 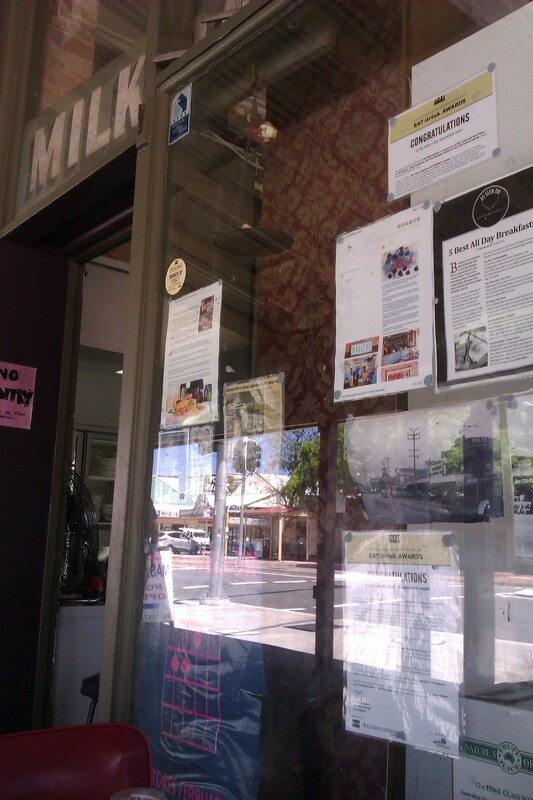 We often go to Avid Reader in West End because it’s fabulously booky, and so are we. However, as she lives on the north side of Brisbane, I wanted to even things up a bit and find somewhere close to her. The north side is a tricky spot for eating out and good coffee. Only in the last couple of years have quality coffee spots popped up, finally serving the jittery masses as they commute into town. For coffee, Dandelion and Driftwood gets the most attention, but newcomer Pod in Stafford (yes, I know. Stafford) looks like it could be promising and Metro Espresso on Edinburgh Castle Road has long served the passing traffic. When I worked on the north side, I never went to Metro Espresso regularly as it was a dangerous road to cross and because their iced coffee had ice cream in it. Period. It may have changed by now. 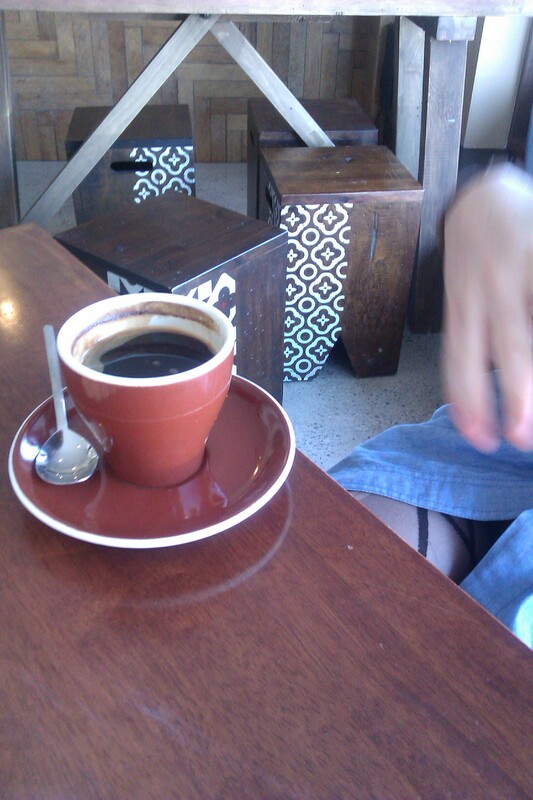 If I did get caffeinated libations on the way to work, it was often at Idea Cafe on Shaw Road. It’s easy to pass by but was safer to park and served consistent quality coffee. And they never minded my iced latte on soy requests. I can imagine locals enjoying this cafe a lot- it’s right next door to the local hydrobath, so diners sitting at the back table are rewarded on the weekend with cute pooches and children roaming around (but not too close; I don’t like other people’s kids sharing my experience too much). Just down the road is Shaw Park, a large sporting and parkland area, it would be a great way for Kedron-ians (Kedronites?) and Wooloowin residents (I give up) to begin the weekend. We got a table at about 9 and ordered the avo and tomato toast on turkish. I ordered peppermint tea with mine, and my friend had a flat white. I would have liked a poached egg, but there is only a hot plate, not a hob, in the kitchen and eggs are done scrambled or fried. You can sit up front near the tree-line road, at the coffee bar on a stool, or on one of the little tables down the side. They also had several chairs that still had folded blankets over the back, which is a nice sign of consideration. Although I prefer my toast as sourdough, this turkish bread was toasted flat, making it easy and manageable. It was a simple, nice meal done well. My friend liked her coffee, but I don’t know how fantastic their coffee is overall as I didn’t get a chance to try for myself. Although we hardly sampled the most complex of dishes (I want to try their banana bread with ricotta, honey and caramelised banana! ), I really enjoyed eating here. When a waiter came to tell me I couldn’t have poached, it was done with grace and apologies. When we stayed for THREE hours catching up, we weren’t hassled or given passive-aggressive waiter body language to leave (it wasn’t a packed Saturday, so we weren’t keeping a table from someone). When we forgot to pay (yes, I’m awful) and came back ten minutes later, the staff laughed and said it happened all the time, but everyone always comes back and fixes them up. I get the impression from other reviews I’ve read in the past that this is not the place for a huge group or a late lunch, but for a brekkie for two, it was clean, fresh food and a great start to my weekend. 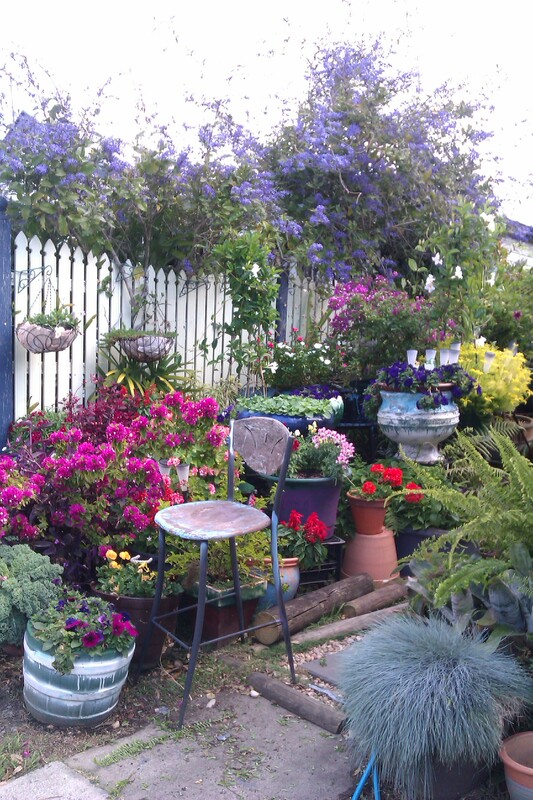 And just because, check out this dude’s amazing garden just a couple of doors down the road. Amazing! The love and attention to this garden was not done justice on my smartphone! So my sister and I had to have breakfast together at least once before I went back to work. She suggested Paw Paw, on Stanley Street in East Brisbane. The reviews were good, but couldn’t explain how much I was going to enjoy the meal. It’s easy to find, although technically entry is off a side street of Stanley. It’s behind the Papaya restaurant and is run by the same people, whom we also discovered, run Thai cooking classes. We could sit anywhere and were served promptly by a friendly waitress with water. 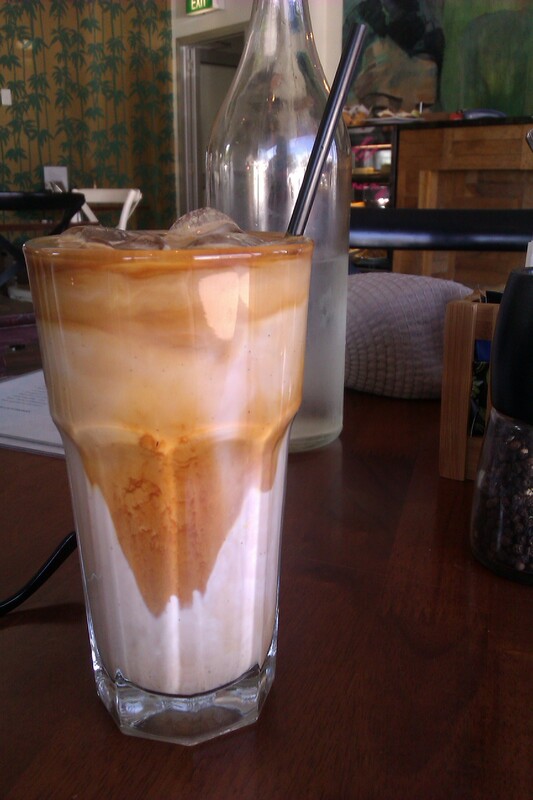 I know I’m in good hands when a place does an Iced Latte, not just an Iced Coffee. I don’t like the ice-cream and cream in Iced Coffees (ok, I DO like them, very much, but it often confuses wait-staff when you order it with soy milk!) so they’re good choices. I’ve been to café where they ONLY do Iced Coffees with some kind of dairy (one place said their pre-made Iced Coffee mix was made on ice cream and milk was added. Yuuuck) and if you just ask for the coming together of coffee and cold soy milk, you get looked at as if you came from another planet. Or Sydney. So it was nice to have the waitress let me know that they definitely do coffee and cold milk and, like many places these days, call it an iced latte. Poifect. 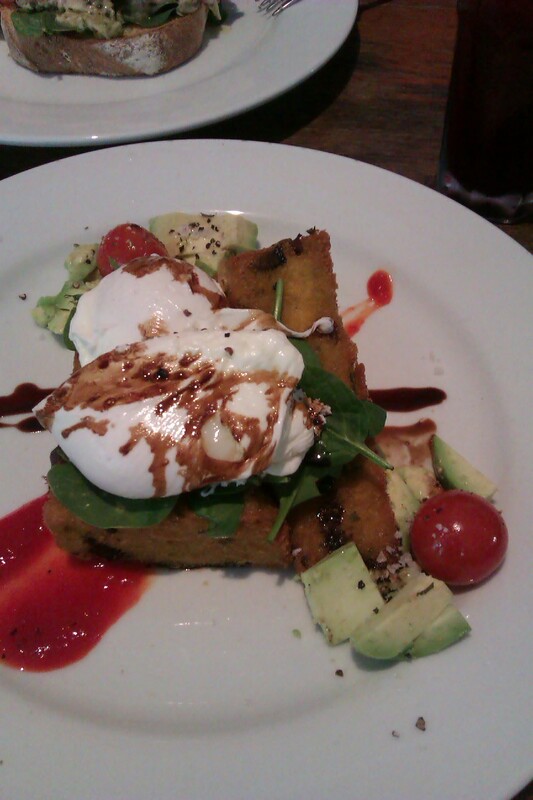 My sister ordered the corn fritters served with relish and chipotle sour cream and a long black. 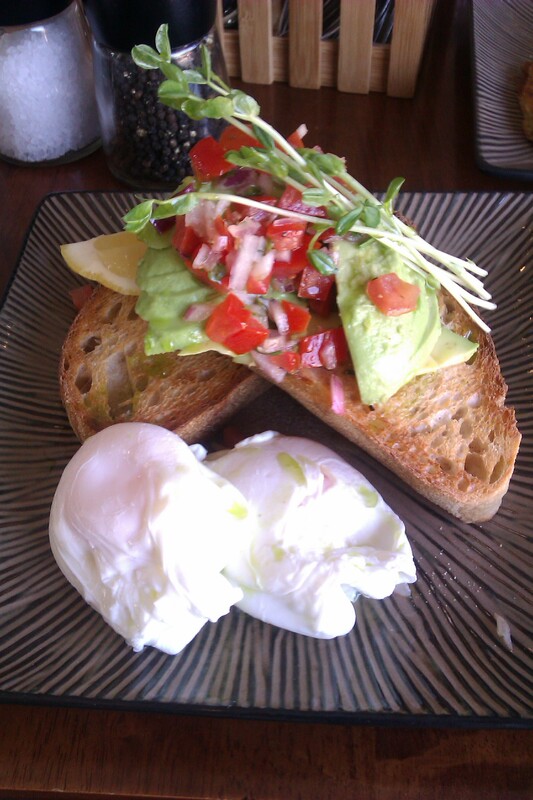 I ordered the avo sourdough with tomato and coriander salsa and, because the menu suggested it and I wanted a protein hit, two poached eggs ($12). 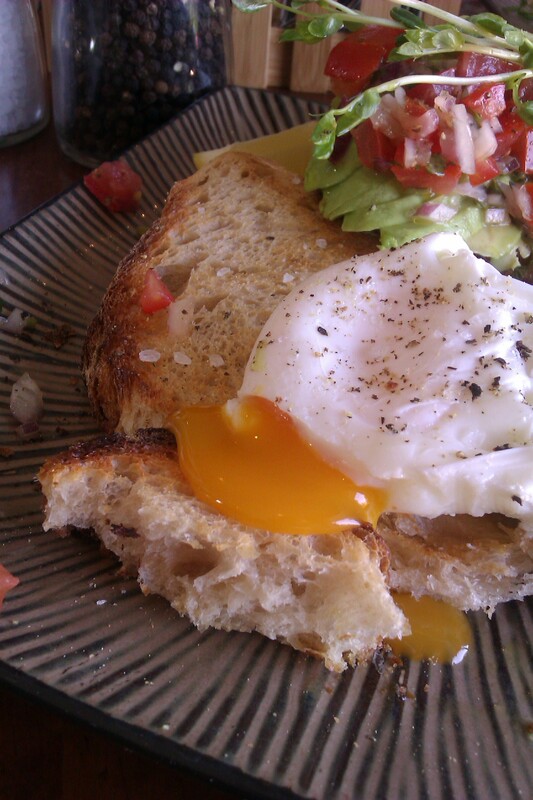 Poached eggs are the other sign, for me, of a good breakfast menu. Poached egg enthusiasts, you know what I mean. I liked the table set up here: each table had a caddy with menus, thick napkins, sugars, S & P and cutlery. I like that “help yourself” mentality. It makes it easier on the wait staff so they’re not running around for small, yet important items and you get what you want with minimal fuss. The coffee came out quickly and were both good. Our breakfasts would have been worth the wait, if we’d had to wait. Which we didn’t. We spend a few short minutes drinking our coffees and listening to the lady on the phone who had to leave quickly because her son had stuck a sunflower seed up his nose at day care. 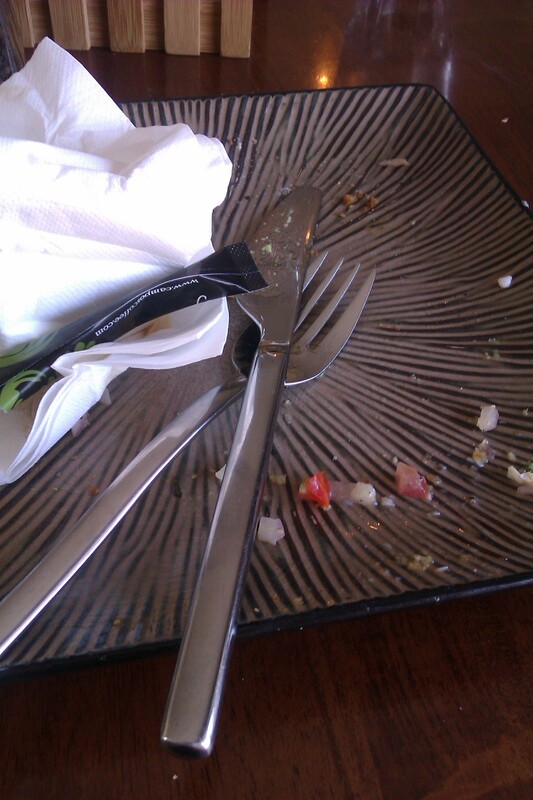 Then, it seemed, our food arrived. 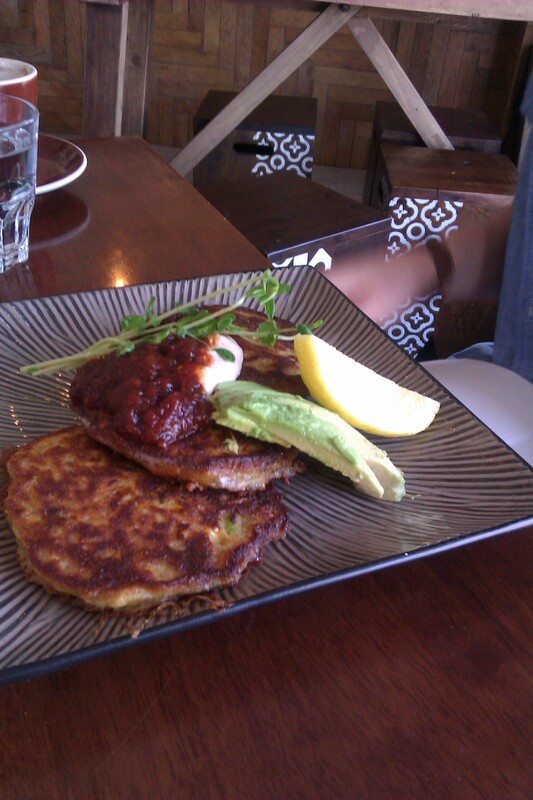 My sister is a bit of a pancake and fritter connoisseur and cooks them regularly at home and said the corn fritters ($12.90), which were served with a healthy wedge of avocado, were perfect. I tried some with the tomato relish, and they were great. Avo toast is so easy to get right but so hard to elevate to a better place. This was yum. The bread was thick and, although the crust was super crunchy and hard to cut (perhaps a steak knife would have helped), the avo was ripe and the home made tomato, red onion and coriander salsa gave the whole thing a lovely freshness. 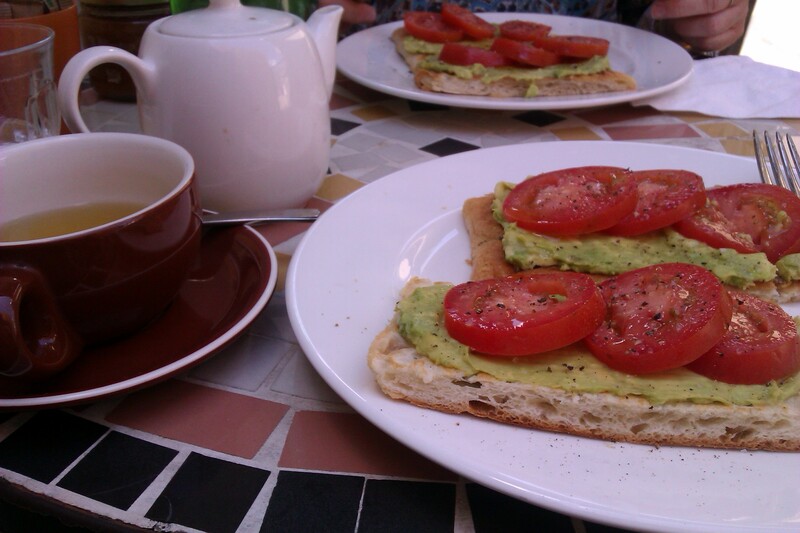 For many cafes, avo toast is the only thing that is/could be a vegan option, and this wouldn’t disappoint. This is a vegan option worth leaving the suburb for. As I stated before, I ordered mine with two poached eggs, which were near perfect and delicious (I’m overly picky with my poached though. I love solid whites and runny yolks. If the white is undercooked AT ALL, I find it a bit revolting and pick it out. These did not disappoint). I was super full by the end of it, but not sickeningly so. The sides they offered were great too. All the traditional ones, plus things like black beans. 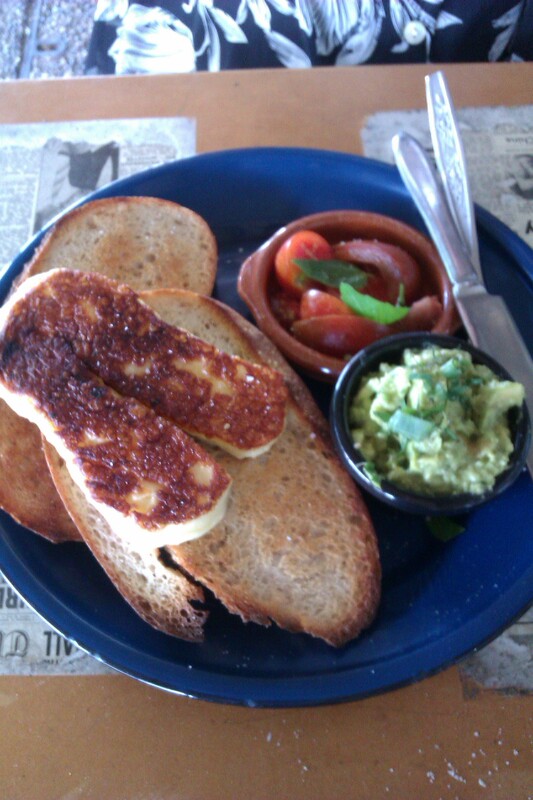 You could also get haloumi, which I might have to try with another avo toast another time. 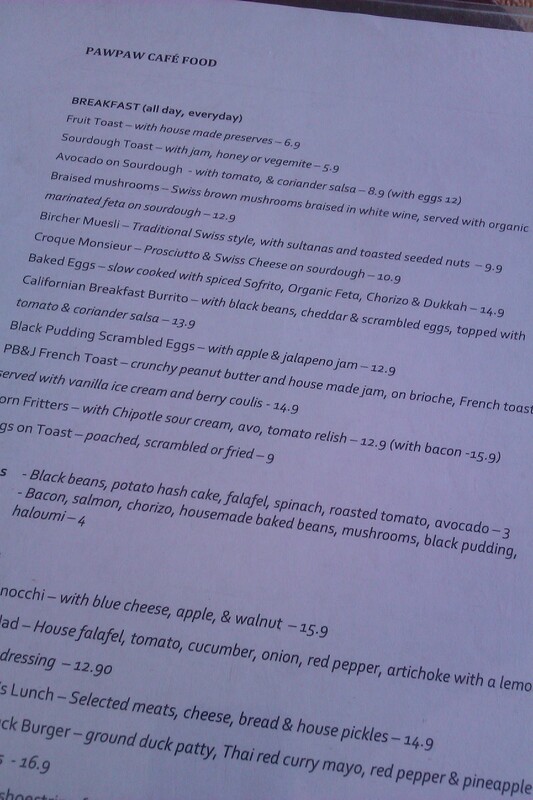 I’ll just have to come back to try the Californian breakfast burrito, the PB&J French toast and the mushrooms.